I was walking around Christ Church Cathedral in a warm Sunday morning when I heard someone whispering in my ear: “Don’t take me photo! Hahaha!”. The guy who sneaked behind me to make that joke was a small, well dressed, 60 years old fellow who looked like he had seen a lot in his life. He was probably the head of the gang, as the young up-and-coming soldier next to him was just about 25 and had no less than 7 fresh cuts on his face. Definitely not from shaving. The other three massive guys around them were about 45 and, while pretty comfortable in their shoes, they seemed to be there to listen, not to speak. Out of self-preservation, I didn’t take he photo. It was my second day in Dublin, but only then I realized: Ireland is real. The Irish are real. And not in a bad way, don’t get me wrong. For three full days, everyone in Dublin wanted to know about me. Everywhere I went, people were asking me how am I doing, am I alright? At Starbucks: “How are you, you’re OK?”, at McDonald’s “Hi man, you’re alright?”, at Burger King “Cheers mate, how’s your day so far?” When I was stopping people on the street to ask for directions, they were still asking me if I’m doing well. Even the bus drivers! I was starting to feel guilty that I don’t have an interesting story to tell them. Whatever your business with them, they genuinely want to know about your life first. If you’ve never been there, you may not be aware, but they don’t speak only English. They have their own language, the Irish Gaelic. You find out about this when you notice that most of the street signs are written in both languages. C’mere ‘Til I tell Ya (=word for word: come here until I tell you, but it actually means that the person wants to tell you a secret or an interesting story). Ye Bleedin Dooope Ye (=you are a fool, you are silly, you’re not that smart). The famous Trinity College, now in the heart of the city, was actually built outside of Dublin. It’s only because the population and the city grew so much, that it is now in the city center. The Library at Trinity is a legal deposit library and it has by now a stock of over five million books (a copy of every book printed in Britain and Ireland). 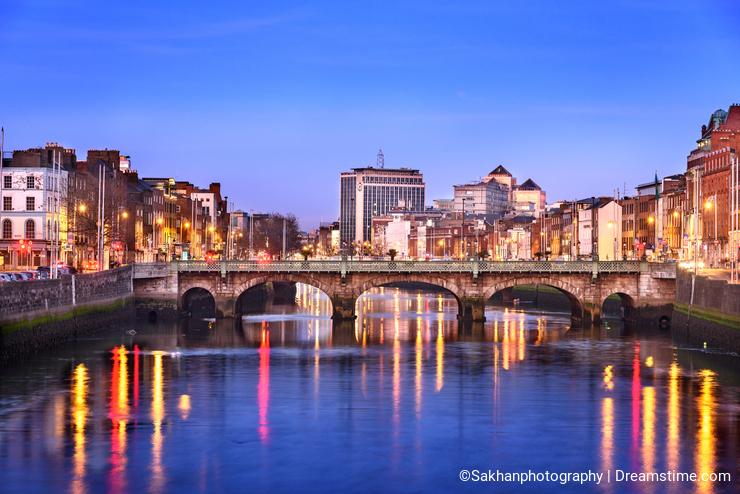 The O’Connell Bridge was originally made of rope. Now, it is the only traffic bridge in Europe which is wider than it is long. The legend behind the doors of different colors is that when the men came home after a night at the pub, they would remember the color of their door, so they wouldn’t break into their neighbor’s house by mistake. The truth may have something to do with the Georgian Dublin Era back in the 1700’s, but I like the legend better. Speaking of pubs, another legend says there are exactly 666 licensed pubs in Dublin. The truth is there are more than 750, but I suppose there were 666 at some point, so you can stick to the legend if you prefer. And speaking of pubs again, the Temple Bar area was pretty run down and supposed to be demolished in the 1980’s and transformed into a bus station. I guess everyone is happy now that they didn’t do it. And speaking of pubs again, Saint Patrick’s Day is just around the corner. It’s actually a cultural and religious celebration held on 17 March, the traditional death date of Saint Patrick. However, it’s also the National Day of Ireland, so if you needed an excuse to go to the nearest Irish Pub and have a pint of Guinness, there, you have it. 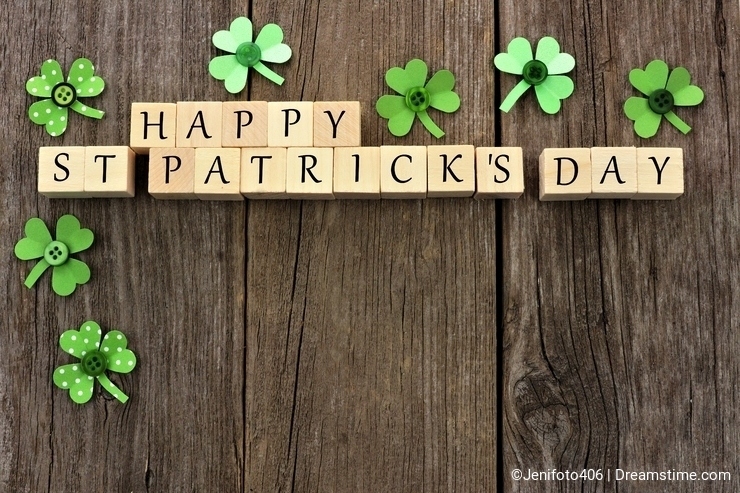 Happy Saint Patrick’s Day to all of you celebrating, Irish or not! Ahh It Was Rapid, Man! (=I had quite a great time, I really enjoyed it). Photo credits: Attila Tatár, Viorel Dudau, Jennifer Barrow, Patryk Kosmider, Shahid Khan. Good one. Now I got to know more about Dublin, though I was there last July. Super interesting and timely! I will be visiting Dublin for 2 weeks in the fall and look forward to unique sites and cultural adventures. A good article and nice photoos of Dublin.Ireland is one of the countries I would like to visit in the future. Thank you for reading! @2darrenleeming: oh, so it's not just me? @Danielc1998: I don't usually drink, so I wouldn't know about that. But I know the expression: "and some ketchup, please!" Thank You for telling us about your experience in Ireland. Great insights Viorel! I've always wanted to visit Ireland - not Dublin particularly but Drogheda and County Clare. Still hoping to accomplish that dream one day... And of course great photos! Nice article and experience, actually I just came back from Ireland and I will go back soon. I was there for 12 days and is impossible to photograph everything, my hotel was in Dublin but went to several places, love Ireland. Lovely post..there is a lot more to Dublin than just pubs and sights...and Irish really get annoyed with all the are you all right business.. Seriously.. I'm fine..stop asking.. Happy Paddy's day! You forgot to mention the most important irish word you need to know if you go to a pub : Sláinte ! It was great to read and learn something about Irish culture. Loved the legends!